Smart deadbolts eat batteries for breakfast. I know, because I have five of them installed on various entry doors in my own smart home, and I replace the batteries in each one two to three times a year. 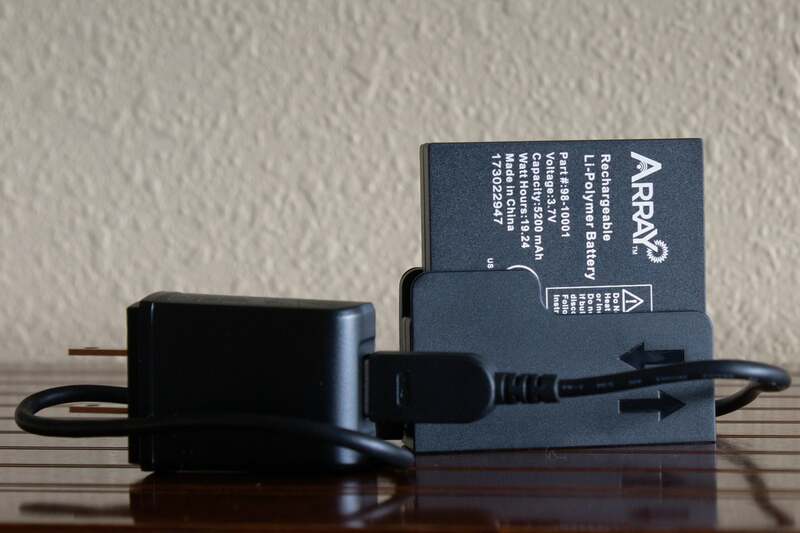 So when I learned that the Array by Hampton was not only powered by a rechargeable battery, but that its battery is continuously topped off by an integrated solar panel, I thought “Brilliant!” After thorough testing, I can say Hampton has solved the battery problem, but as good as it is, this lock won’t be the right addition for every smart home. The Array’s biggest drawback (for people who live in smart homes, at least) is one that Hampton touts as a feature: It connects to Wi-Fi, with no additional hub needed. Most smart deadbolts use one low-power connectivity technology or another—Z-Wave, ZigBee, or even Bluetooth—because Wi-Fi consumes too much battery power. Since any device that needs to be accessible from the internet must have an IP (Internet Protocol) address, Z-Wave, ZigBee, and Bluetooth devices rely on a bridge to connect to your Wi-Fi network. With a few notable exceptions (Philips Hue smart bulbs have their own bridge, for instance), that bridge is typically a smart home hub that integrates smart locks and other smart home components (door, window, and motion sensors; thermostats; smart plugs and lighting controls; security cameras; and more) into a cohesive system you can control with a single app or a web interface. A rechargeable battery is a great idea for a smart lock. Mounting a solar panel on the other side of the lock to trickle-charge it is an even better one. Since the Array bypasses the hub—once again, Hampton says this is an intentional design decision, not an oversight—it can’t be integrated into a smart home system such as Samsung SmartThings or the Vivint Smart Home system that I use. Hampton was smart enough, however, to add support for Amazon’s Alexa digital assistant. The company will soon release a firmware update that adds support for Google Assistant, and it’s working on HomeKit support as well. If you own an Amazon Echo and enable the Array by Hampton skill, you can use voice commands to ask about the lock’s status (“Alexa, is the front door locked?”) and to lock it (“Alexa, lock the front door.”) You also have the option to unlock the lock using a voice command, but this requires that you first establish a four-digit verbal PIN. Personally, I wouldn’t recommend enabling this feature as it would be all too easy for someone to overhear you speak the command, learn your PIN, and thereby gain unauthorized access to your home. But Hampton tells me Amazon requires the option to be available to users. 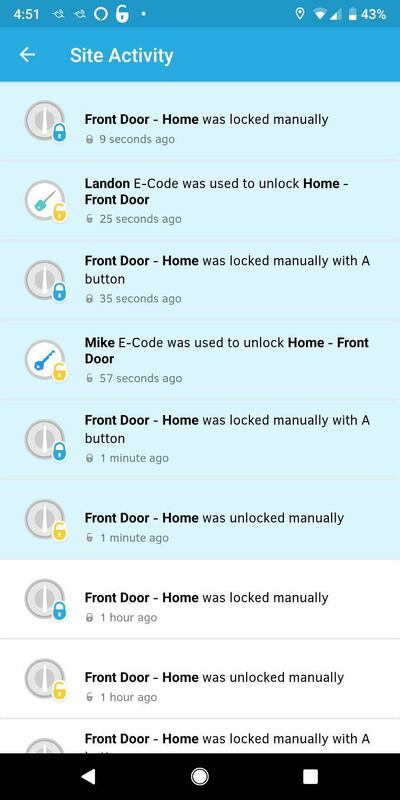 The Array app maintains a detailed activity log showing when and how the deadbolt was locked and unlocked. When the keypad is used to unlock, the person to whom that code was assigned is also registered. Some would say the Amazon Echo is a smart home hub in and of itself (and the Echo Plus does have a ZigBee radio onboard that can control smart bulbs and other ZigBee devices). Any Echo model will let you group devices into rooms and create routines in which a single voice command triggers actions on multiple groups of devices at the same time. Indeed, the Echo family goes a long way toward breaking down the silos in which various smart home gadgets—and various brands of smart home gadgets—operate (with or without a hub). In fact, Alexa has become a sort of lingua franca in my own smart home, enabling me to combine Philips Hue, Noon Home, Lutron Caséta, and various Z-Wave controls with my Vivint system. Vivint doesn’t support Lutron or Noon directly, but it doesn’t matter all that much since there are Alexa skills for all those things. Where the Array falls short for me and people like me is its inability to disarm the security aspect of my smart home system. I’ve programmed the Vivint control panel so that when I enter a valid code into any of the Z-Wave smart locks enrolled in the system, those locks immediately disarm the security system. That saves me from running to the control panel to enter my passcode before the entry delay ends and the alarm goes off. If you don’t need to integrate your smart lock into a larger smart home system, the Array by Hampton has a pretty strong feature set. And Hampton has a matching entry handle set that’s even better, but I’ll get to that later. Should there not be enough sunlight at the installed location to keep the Array’s battery charged, Hampton provides a second one—and a battery charger—in the box. The Array’s approximately 2 x 2.75-inch solar panel is the star attraction. It trickle-charges the onboard battery and, depending on how much sun it’s exposed to, will keep the battery topped off. I installed it on my front door, which has a southern exposure, but the door is recessed into my porch and the roof overhangs it by about nine feet. The battery had a 95-percent charge when I took it out of the box, and after a couple of weeks of heavier-than-typical use, the app was reporting the battery level at 75 percent. That tells me that the battery is being discharged faster than the solar panel can recharge it. Hampton seems to have anticipated this and provides a second battery in the box, along with a USB charging cradle and AC adapter. And should the battery fail while you’re out and about, the Array is equipped with a conventional key-lock cylinder. The pair of keys that come with the lock look just like Kwikset keys and are even embossed with a KW1 beneath Hampton’s Brinks branding, which is also stamped on the key-lock cylinder. You slide the solar panel up to reveal the 10-digit numeric keypad, which features mechanical metal buttons backlit by blue LEDs. You use the Array app to create E-Keys and/or E-Codes to unlock the door. E-Keys require the user to have the Array smartphone app on their phone (it’s available for Android and iOS). They’ll receive an emailed invitation to create an E-Key. The metal buttons on the numeric keypad are backlit by blue LEDs, making them very easy to read in the dark. E-Codes are different in that they can be always active, limited to a schedule (every day, certain days of the week, or on a recurring monthly basis—on the first Monday, for instance), or even on a temporary basis. Such recurring active periods can also be limited to a window of time. And for instances where you trust someone—such as a maintenance person—to access your home while you’re not there, you can also create one-time use e-codes. Anyone with the Array app installed who’s been issued an E-Key can also see the status of the lock (locked or unlocked), and they can lock and unlock the Array with their phone. Users with Admin status can access an activity report detailing every date and time the lock was locked and unlocked with a code (identifying the user), manually (using either the interior lever or from the outside with a key), or locked using the A button beneath the keypad. Geofencing support is no substitute for automatic locking (and it should be noted that the geofencing feature is in beta mode). 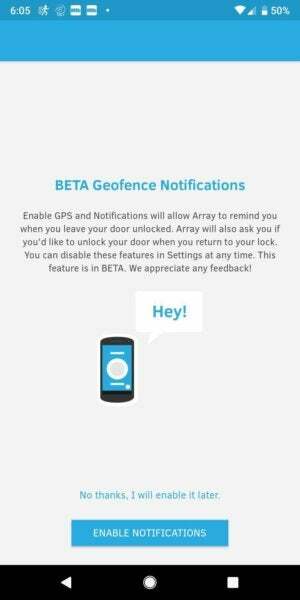 The Array supports geo-fencing (although the feature was in beta testing at the time of this review). 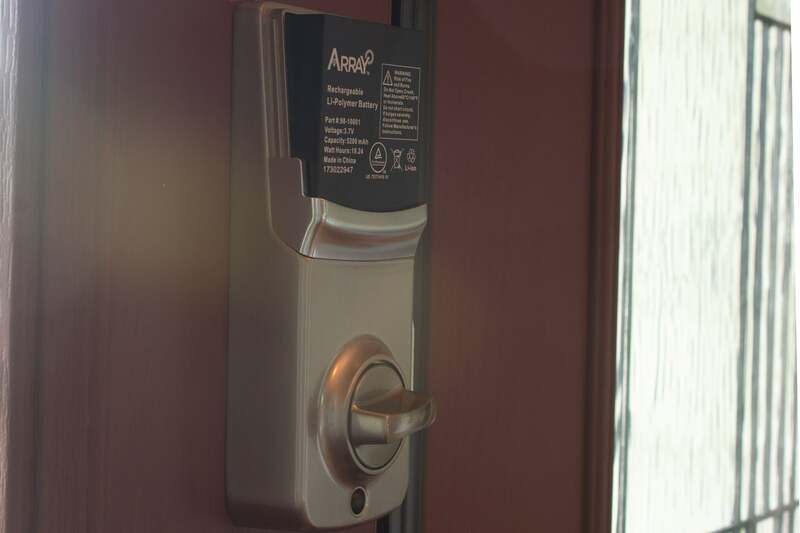 This enables the app to send a notification to your phone when you leave your home (with your smartphone on your person, of course), so you can lock the door if you’ve forgotten. When you return, the app will ask if you’d like to unlock your “preferred” lock (the one you’ve indicated in the app that you use most often). But there is no provision for having the lock automatically re-lock after an elapsed time. Geo-fencing is all well and good, but it’s no substitute for automatic locking, because it by definition depends on your leaving home. If you’re at home and forget to lock the lock (and you don’t look at the app), it will remain unlocked and you’ll be none the wiser. We tend to limit our conception of smart home products to things that are electronic, especially ones that can be controlled with a smartphone. 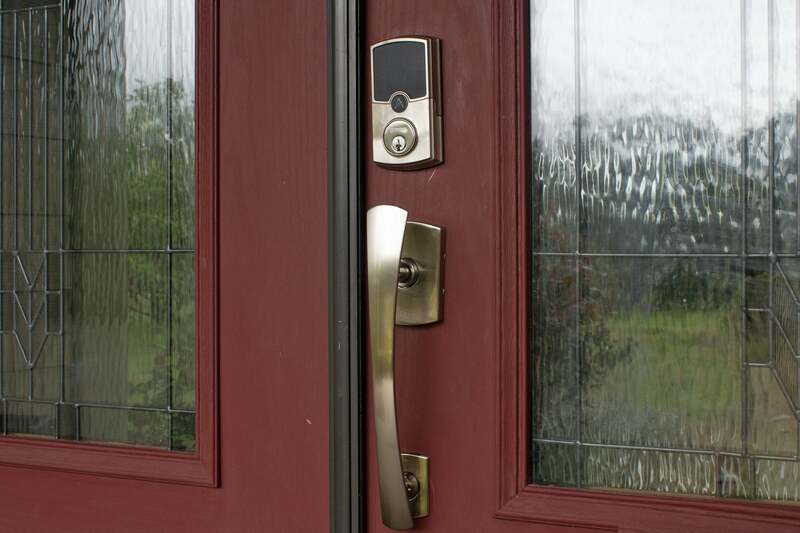 The entry handle set that Hampton sent along for this review—a Brinks Home Security Push Pull Rotate—is entirely mechanical, but that doesn’t make it any less smart. In fact, it’s a genius idea. Once the deadbolt is unlocked, you don’t need to rotate the interior handle to open the door—the simple act of pulling on it—which you’d do to open the door anyway—retracts the latch. You can also rotate it and pull, as you would with any other door knob, but you don’t need to (and I’ve been unable to break myself of that action simply because it’s an ingrained routine). 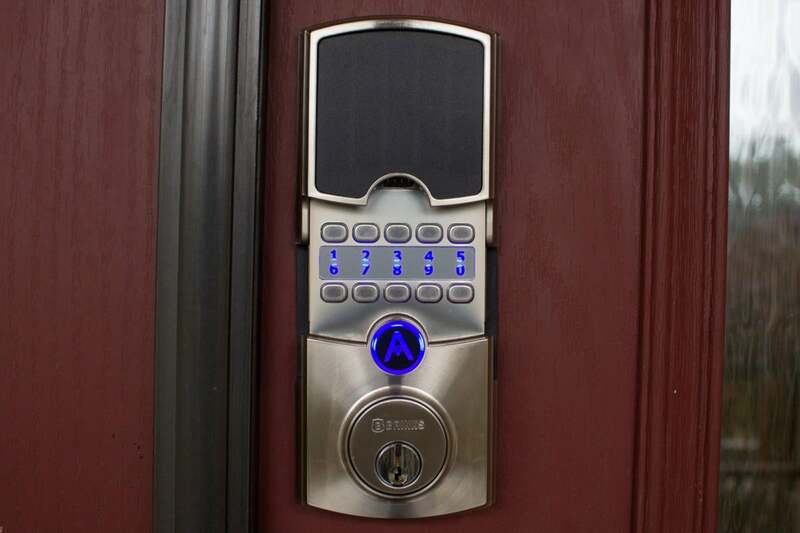 The Array deadbolt and Brinks Push Pull Rotate handle set installed on the front door of the author’s smart home. Opening the door from the exterior is even easier—you simply push on the handle to retract the latch. Here again, it’s an action you would do anyway, but there’s the added benefit that if your hands are full of groceries, muddy from being outside in the garden, or in countless other situations where grabbing the handle would be awkward or undesirable, you can just bump it with your hip and boom! The door will swing open. The catch, of course, is that the deadbolt needs to disengaged first. Yeah, you could enable that Alexa unlock feature, but are you sure you want to? Is the Array by Hampton better than the other smart locks? Paradoxically, the Array by Hampton smart deadbolt is better suited for people who don’t live in smart homes than those who do. Alexa integration is table stakes for a product in this category these days, but I dig its robust construction, its solar panel and backup battery, the hidden keypad with its metal buttons, and I like almost everything about its app. But the inability to enroll it with my Vivint smart home hub—or any other smart home hub, for that matter—is a major buzzkill.